Type 1 diabetes, the most common form of diabetes in children, is a condition by which the body fails to produce insulin. It is classified as an autoimmune disorder, meaning that the body's immune system, for unknown reasons, attacks its own cells. In the case of type 1 diabetes, it is the insulin-producing beta cells of the pancreas that are targeted for assault. There is no cure for type 1 diabetes, and the cause is still unknown. As such, you will need to learn how to manage the disease by routinely monitoring the child's blood sugar, diet, and exercise which delivering insulin injections when needed. Insulin is a hormone produced by the pancreas that helps the body use and store sugar (glucose) for fuel. In the absence of insulin, the glucose in the blood can accumulate, causing hyperglycemia (high blood sugar). If on the other hand, there is a sudden drop in insulin, the glucose level can also dive, leading to hypoglycemia (low blood sugar). Both can cause adverse symptoms and lead to long-term health complications. 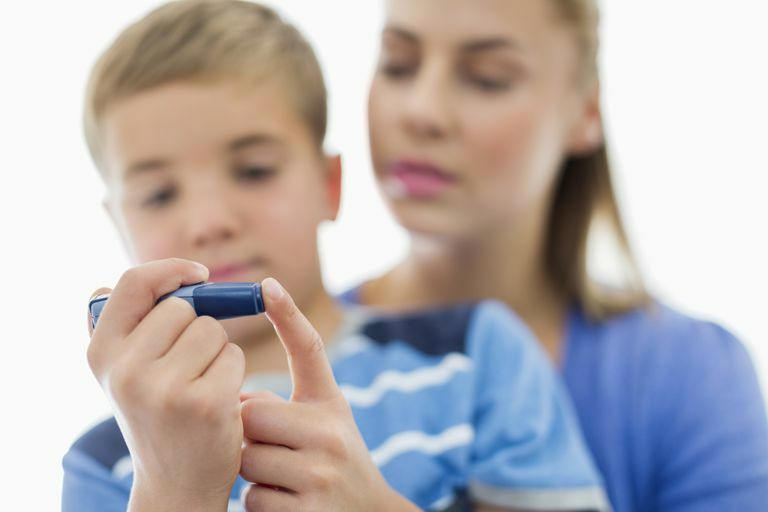 The recommended levels are considerably higher than adults because children with diabetes are at significantly higher risk of hypoglycemia and typically need this extra, protective margin. When monitoring levels, it is important to keep a journal of meals, meal times, blood glucose readings, and physical activities to get a better sense of the ups and downs your child typically experiences. In this way, you can obtain tighter insulin control and avoid illness. The child may be prescribed a fixed dose of intermediate and rapid-acting insulins. With fixed doses, the child must have meals when the insulin levels are at their highest. Meals should be eaten at the same time every day with the same proportion of carbohydrates, fats, and proteins. Some children may benefit from combining a rapid-acting insulin with a long-acting one. These will still need to be taken at mealtimes. The dose of the rapid-acting insulin will be calculated based on the carbohydrate content of the meal. Other children may be required to use an insulin pump, a medical device the delivers a constant flow of medication. A rapid-acting insulin would also be needed with doses adjusted per carbohydrate intake. The symptoms of hypoglycemia are often unrecognized by children who are either unaware of what is happening to them or can't explain how they are feeling. This demands that you, as the parent, watch for the signs and take immediate action when needed. The signs of hypoglycemia will typically appear as the blood glucose drops below 70 and can lead to symptoms such as irritability, drowsiness, weakness, trembling, confusion, headaches, and dizziness. In severe cases, double vision, convulsions, vomiting, and unconsciousness may occur. It's a good idea to always keep an emergency supply in the glove compartment of your car. If your child is unable to eat or drink, you can use an emergency glucagon kit instead. Glucagon is an injectable hormone that helps the liver release sugar into the blood, usually normalizing levels within a half hour. Glucagon kits can be obtained with a prescription from your doctor. The management of a child's diet is key to maintaining tight insulin control. It involves strict portion control and adherence to precise amounts of carbohydrates, fats, and protein per meal. When starting, you would typically need to work with a registered dietitian, nutritionist, or pediatric endocrinologist to develop a diabetic meal plan. Over time, as you gain insight into what affects your child's blood sugar, you will develop a more instinctive sense of which food strategies work and which don't. Physical activity also aids in lowering glucose levels. As such, kids with diabetes should get regular, daily exercise, ideally under supervision to monitor for any risk of hypoglycemia. The child's school and coaches should also be appraised so that they know how to respond appropriately in the event of an attack. Finally, the child should also wear some form of medical identification, such as a medic alert bracelet or necklace. American Diabetes Association. "Standards of Medical Care in Diabetes—2016." Diabetes Care. 2016;39(Suppl 1): S1-S106. DOI: 10.2337/dc16-S003. Nansel, T.; Iannotti, R.; and Liu, A. "Clinic-Integrated Behavioral Intervention for Families of Youth With Type 1 Diabetes: Randomized Clinical Trial." Pediatrics. 2012; 129(4): e866-e873. DOI: 10.1542/peds.2011-2858.